This is a great combination and as simple as it can get. 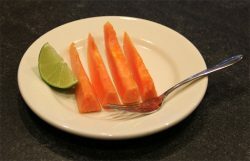 Cut papaya in half lengthwise. Scoop out seeds and pulp. Cut into serving size wedges. Remove skin by cutting horizontally between fruit and skin. Arrange on plates and serve with wedges of lime. Squeeze lime juice over fruit while eating. An easy recipe for a small whole chicken stuffed with quartered mushrooms and lots of herbs. Based on a recipe by Florence Fabricant, The New York Times. Preheat oven to 400 degrees F. Line a roasting pan with foil for easy clean-up. Rub chicken with olive oil and season inside and out with salt and pepper. Quarter mushrooms. If using shiitake mushrooms, remove stems. 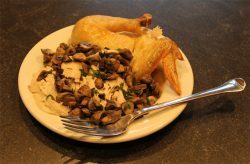 In a medium bowl combine mushrooms with garlic, parsley, and thyme; pack tightly into chicken cavity. Tuck wingtips behind chicken and tie legs together to secure stuffing. Place chicken on a rack in roasting pan and place in oven. Roast for an hour and 15 minutes. Use a thermometer to check for when done. Remove from oven and transfer to a cutting board. Pour all juices and browned bits into small saucepan, removing excess fat. To the saucepan add wine and mushroom mixture from chicken. Place saucepan on top of the stove and heat, scraping the bottom of the pan. Season the mixture to taste with salt and pepper. Cut chicken in pieces and arrange on a platter. Spoon mushroom mixture around chicken or pass separately in small bowl and serve. Cooking time varies with weight of chicken. An 8 pound chick takes approximately 2 hours and its white meat will serve 6 people. 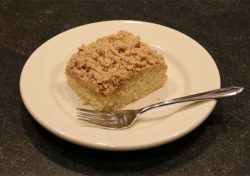 A buttery cake topped with a thick layer of cinnamon - sugar crumbs. Adjust oven rack to upper-middle position and heat oven to 325 degrees F. Spray 9-inch square baking pan with nonstick cooking spray. Cut a length of parchment paper or aluminum oil long enough to have excess to overhang edges. Fit parchment into pan, pushing it into corners and up sides; allow excess to overhand edges of dish. The excess edges are needed to lift the cake out of the pan after baking. In bowl of stand mixer fitted with paddle attachment, mix flour, sugar, baking soda, and salt on low speed to combine. With mixer running at low speed, add butter one piece at a time; continue beating until mixture resembles moist crumbs, with no visible butter chunks remaining, 1 to 2 minutes. Add egg, yolk, vanilla, and buttermilk; beat on medium-high speed until light and fluffy, about 1 minute, scraping once if necessary. Transfer batter to baking pan; using rubber spatula, spread batter into even layer. Break apart crumb topping into large pea-sized pieces and spread in even layer over batter, beginning with edges and then working toward center. Do not press topping into batter. 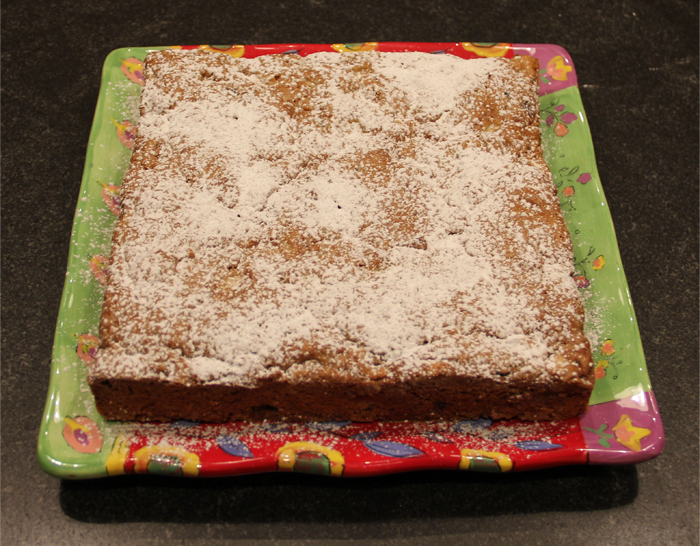 Bake until crumbs are golden and wooden skewer inserted into center of cake comes out clean, approximately 35 minutes. Cool on wire rack at least 30 minutes. Remove cake from pan by lifting parchment overhang. Dust with confectioners' sugar just before serving. 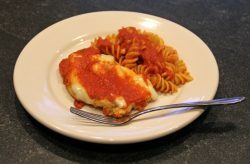 This is a classic Italian-American recipe for boneless chicken breasts dredged in breadcrumbs and Parmesan cheese, browned in a skillet and then coated with marinara sauce and topped with mozzarella cheese. Mix flour, salt, and pepper. Dredge chicken breasts with seasoned flour. Dip them in egg lightly beaten with water and then dredge in a mixture of Parmesan cheese and bread crumbs. In a large non-stick or cast iron skillet heat 1/4 cup of olive oil over medium heat, add chicken and brown on both sides. Remove breasts as they are cooked to a plate covered with paper towels. When one batch is done, wipe down skillet with paper towels and repeat until all of the meat is cooked. Cover bottom of baking dish with thin layer of marinara sauce. Place chicken in single layer on top. Arrange slices of mozzarella on top of chicken and cover with additional marinara sauce. Bake in oven until cheese melts, approximately 15 minutes. Serve with pasta and marinara sauce. Also makes a great sandwich on Italian or French bread. 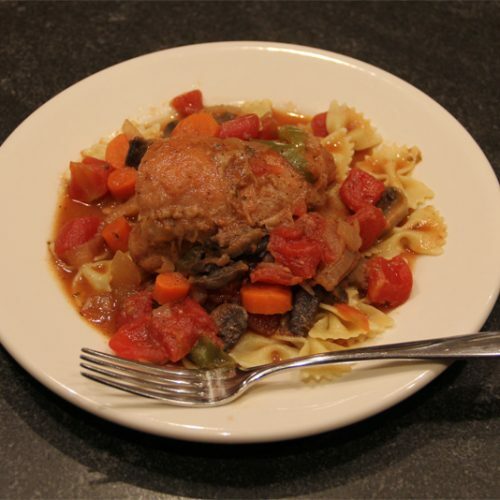 This version of a classic French braised chicken recipe has a very savory sauce made by reducing wine and broth. Based on a recipe from Cook's Illustrated, September, 2006. In a saucepan, combine wine, broth, parsley, and bay leaves. Bring to a boil, reduce heat and simmer until reduced in half. Salt and pepper the chicken. In a hot Dutch oven, melt a tablespoon of butter and brown thighs in two batches. Remove to a plate. Add bacon to pot and render. Then add two tablespoons of butter and mushrooms; sautee for a few minutes. Then add pearl onions and garlic; sautee for 30 seconds. Add salt and pepper to taste, and some chopped parsley. Return chicken thighs to Dutch oven. Use a strainer to pour liquid reduction over chicken. Add tomato paste and flour, and stir. Bring to a simmer and reduce heat. Cook uncovered over low heat approximately one hour. Serve with egg noodles, garnish with chopped parsley. Pinot Noir works well for this recipe. Don't use a wine that is too dry or too sweet. A nice cake that travels well for outings and works equally well for guests. Inspired by a recipe by the same name in The Good Housekeeping Illustrated Cookbook. Place oven rack in middle position and preheat oven 325 degrees F. Grease well and flour a 9-inch square cake pan. In large bowl of a stand-mixer at low speed, mix well first 7 ingredients (flour through eggs), scraping down sides of bowl as necessary. Beat 3 more minutes. Stir in apples, nuts, and raisins. Spread evenly in pan. Bake 1 hour to 1 hour 5 minutes, until a sharp knife inserted in center comes out clean. Remove from pan and cool on wire rack. Sprinkle with confectioner's sugar just before serving. 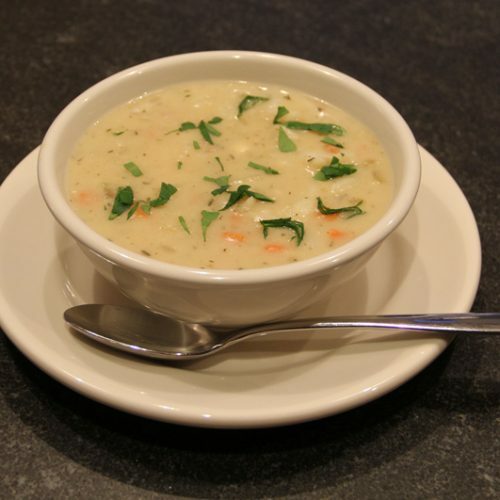 A creamy chowder with bite sized pieces of cod and diced vegetables. Place a 6-quart stock pot over medium heat; add canola oil. When hot, add Canadian bacon. Cook, stirring occasionally, until very lightly browned, about 4 minutes. Add onions, carrots, and celery; cook, stirring occasionally, until vegetables are soft, about 5 minutes. Add flour and whisk for 2 minutes. Gradually add water while whisking to prevent lumps from forming. Add potatoes, bay leaf, thyme, cayenne pepper, and black pepper. Bring to a simmer. Continue simmering uncovered, until potatoes are tender, 15 to 20 minutes. Meanwhile, in a 2-quart saucepan, heat 3 tablespoons canola oil over medium heat. Add 5 tablespoons of flour, whisk while cooking for about 3 minutes. Do not allow to brown. Gradually add preheated milk, whisking smooth between additions and until thickened and smooth. To the stock pot with vegetables, add fish; cook another 3 minutes. Remove bay leaf and add milk mixture, stir to incorporate, and return to a simmer. Remove from heat, add salt and pepper to taste, stir in Madeira, sprinkle with minced parsley and serve. Haddock fillet may be substituted for the cod. Serving Ideas: oyster crackers, cornbread, green salad or a side of steamed green vegetables. A nice pairing. Can be served as an appetizer for a spring meal. 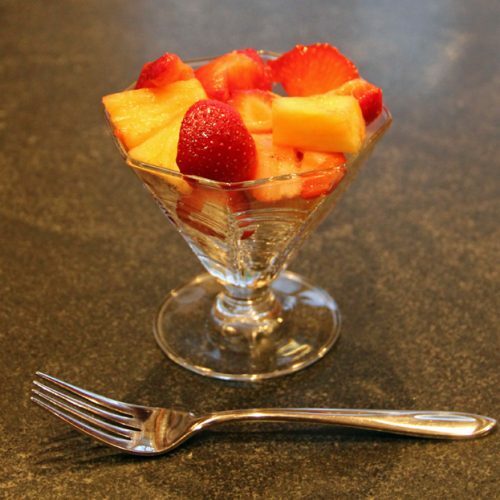 Combine fruits and gently stir to incorporate. This is a fabulous soup that does not have complex ingredients. Make sure the asparagus is in season for the best flavor. 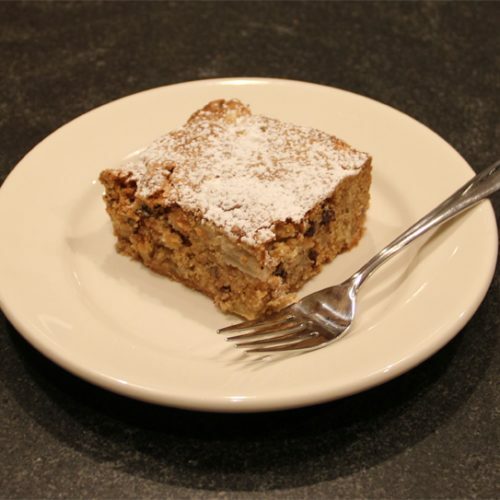 Based on a recipe from Favorite Meals from Williamsburg, compiled and adapted by Chalotte Turgeon, 1982, The Colonial Williamsburg Foundation, p 30. In a 6-quart stock pot, boil chicken broth. Add asparagus, onion, and bay leaf. Return to a boil, reduce heat, and simmer, covered for 30 minutes. Discard bay leaf. Meanwhile, in 2-quart saucepan, melt butter. Whisk in flour and cook over medium heat for 3 minutes, stirring constantly. Do not allow to brown. Add preheated milk in increments, whisking smooth between additions. Mixture should be smooth and thick. Set aside off heat. Puree asparagus-chicken broth mixture using an immersion blender or blender until very smooth. Add milk mixture and either use immersion blender or whisk to incorporate. Add salt and white pepper to taste. A double batch takes 1 hour and 15 minutes to prepare. 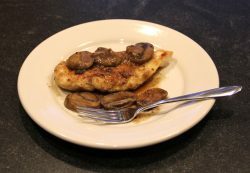 Boneless chicken breast or veal scallopini browned in a frying pan and served with a simple Marsala wine sauce and sautéed mushrooms. Including mushrooms is optional. Based on a recipe from The New York Times Cookbook, Craig Claiborne, Harper & Row Publishers, NY, 1962, p 158. In a 12-inch skillet, heat oil over medium heat. Add sliced mushrooms; sauté until cooked. Set aside in covered bowl to keep warm. In a pie plate combine flour, salt, and pepper. In same skillet over medium heat, add 3 tablespoons oil and heat until shimmering. Dredge meat in seasoned flour and place in single layer in skillet. Brown chicken in two batches, if necessary. Brown on both sides until slightly under-done and transfer to paper towel lined plate. 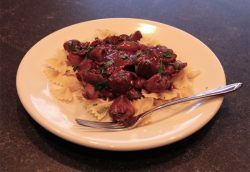 When all chicken has been browned, return to skillet, add Marsala, cook one minute longer over medium heat. Transfer meat to warm serving platter; top with reserved mushrooms. Add bouillon to pan juices. Use whisk to scrape loose browned bits and bring to a boil. Add salt to taste. Pour over mushrooms and meat. Sprinkle with some minced parsley and serve immediately. This recipe can be scaled up for a party. Instead of using chicken cutlets, cut chicken into nuggets and cook in a big batch. 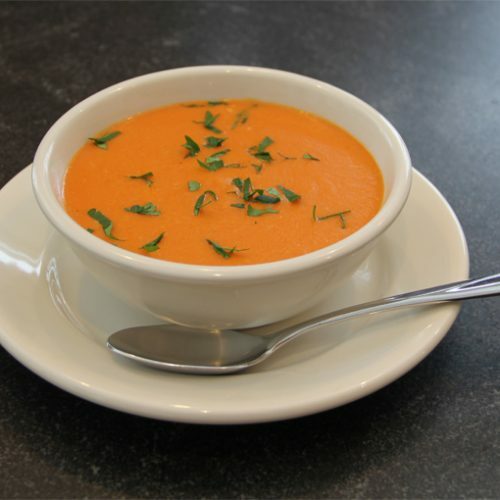 A creamy textured soup with a flavor that offers a balance of tomatoes, celery, and onions. It is rice based but is finished with some light cream. 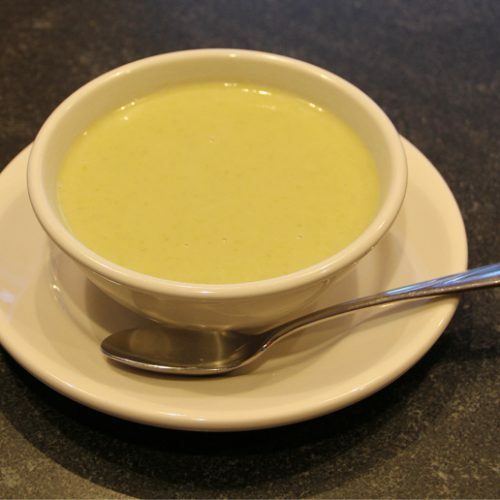 Inspired by the popular menu fixture, Crème Andalouse, at La Bonne Soupe in midtown Manhattan. Place sliced onions in medium bowl and add cold water to cover and cider vinegar. Let soak at least 15 minutes while preparing remaining ingredients. Drain, use towel to squeeze out excess moisture. Roughly chop; a food processor saves time. Place a 6-quart stock pot over medium heat. Add butter or margarine and melt. Add onions and garlic; saute until onion is transparent, approximately 4 minutes. Add celery; saute until celery begins to soften, approximately 4 minutes. Add tomatoes, broth, and tomato paste; stir to blend well. Cover and bring to a boil over high heat. Add rice, cover, and reduce heat to simmer. Cook until rice is tender, approximately 20 to 25 minutes. Remove from heat, cool slightly. Use an immersion blender or blender to puree until very smooth. Add salt and pepper to taste. If too thick, adjust consistency using additional broth. If planning freeze a portion, set it aside before adding cream. Use a whisk to slowly add correct portion of cream to remaining soup. Reheat, if necessary. Garnish with chopped fresh parsley and serve hot. Using a food processor to chop onions and celery will save time. For vegetarian version, substitute vegetable broth for the chicken broth. If doubling, use an 8 quart stock pot and allow additional time. Use field tomatoes or canned for the best flavor. If using fresh tomatoes, add additional time. 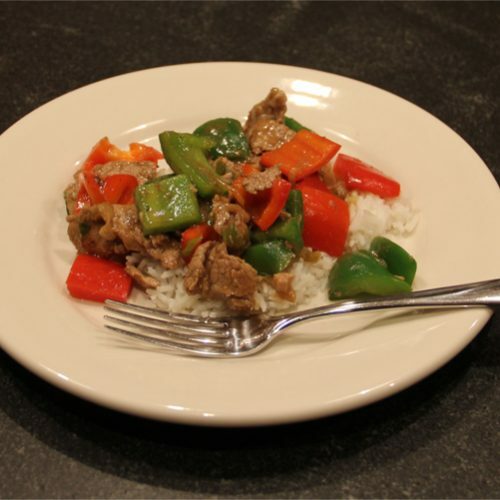 A nice stir-fry with pork loin, marinated in soy sauce and sherry, combined with red and green peppers, green onions and a sauce made with hoisin and dry sherry. Sesame oil drizzled on just before serving lends a nice, slightly nutty flavor. Based on a recipe by Rosa Ross, New Wok Cooking, Clarkson Potter, May, 2000. If serving with rice, start rice first. In a medium bowl, add all marinade ingredients; stir to combine. Add sliced pork, toss to combine; allow to marinate at least 10 minutes. Place a large non-stick or cast iron skillet (approximately 11 inches) or carbon-steel wok on stove, add canola oil and over high heat, heat until just smoking. Add scallions and ginger; stir-fry until aromatic, approximately 30 seconds. Using a slotted spoon, add only pork, reserving excess marinade for sauce at end. Stir-fry pork until no longer pink, about 5 minutes. Add peppers; stir-fry another minute. Add hoisin sauce, sherry, salt, and black pepper; stir to combine. To reserved marinade, add 2 tablespoons of water, then add to skillet. Heat through, stirring to blend well. Remove from heat, drizzle with sesame oil, and serve immediately. The ingredients will just fit in an 11 inch skillet, to scale-up a larger pan is required. 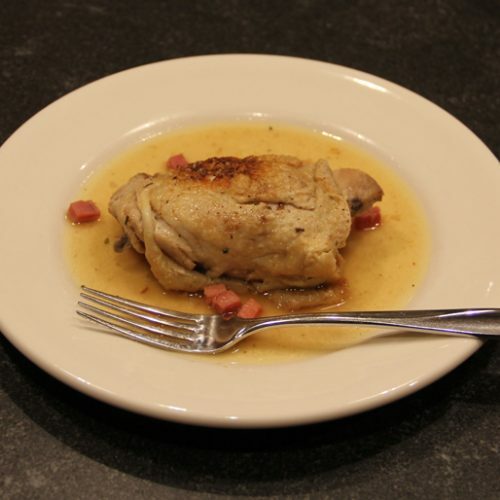 This braised chicken recipe is all about the sauce, made with white wine, broth, prosciutto, sage, bay leaves, cloves, and pepper. At the end it is finished with a bit of lemon juice and rosemary. Based on a recipe from Cook's Illustrated, Kenji Lopez-Alt, May & June 2010, p 19. Adjust oven rack to lower-middle position and preheat oven to 325 degrees F. Use 12-inch cast iron skillet, Dutch oven, or oven-proof pot. Place pot on stove, add 1 teaspoon olive oil and heat until shimmering over medium heat. Add prosciutto; saute approximately 3 minutes when it just begins to brown. Add sliced garlic and saute until golden brown, approximately 1 1/2 minutes. Using slotted spoon, transfer garlic and prosciutto to small bowl. Do not rinse pan. Increase heat to medium-high; add remaining 2 teaspoons olive oil and heat until just smoking. Pat chicken dry with paper towels, season with black pepper, then place skin side down in pot (if using skinless chicken, place bone side up). Cook , without moving until well browned, 5 to 8 minutes. Use tongs to turn; brown on second side, approximately 5 minutes longer. Transfer chicken to large plate. Using tongs, transfer chicken to rimmed serving platter and cover to keep warm. Discard sage leaves, rosemary stem, cloves, and bay leaves. Place skillet with sauce over high heat, bring to a boil, and reduce to 1 1/4 cups, approximately 2 to 5 minutes. Remove from heat and stir in minced rosemary and lemon juice. Add salt and pepper to taste. Pour sauce around chicken and serve. The chicken in this recipe is braised in an uncovered skillet, so chicken with the skin on works best. However, skinless chicken is alright as well but will be a bit drier. Making this phenomenal cake is not too difficult. 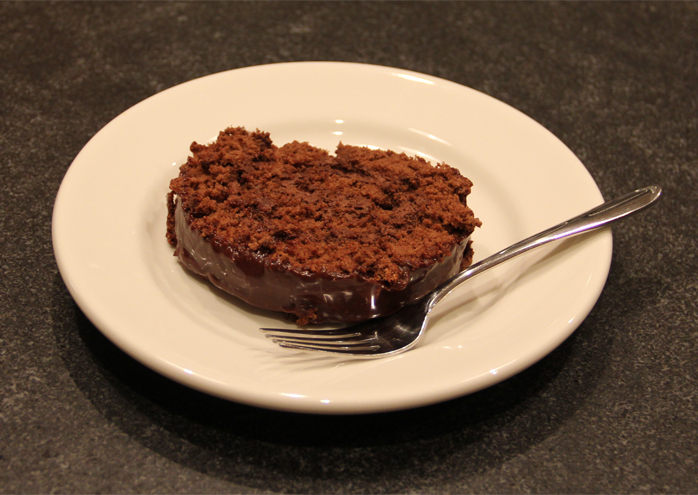 A light, chocolate cake is baked in a rimmed baking pan and then rolled up while hot. Once cool, it is filled with coffee flavored whipped cream and glazed with melted semisweet chocolate. The cake for this recipe is based on a Jelly Roll cake from Betty Crocker's Cookbook, Golden Press, NY, 1983, p 244. Preheat oven to 375 degrees F. Line rimmed baking pan , 15 1/2 x 10 1/2 x 1 inch, with waxed paper and grease generously. In a small bowl, sift together flour, cocoa, baking powder, and salt. Set aside. To the large bowl of a stand mixer, add eggs. Beat at high speed until thick and lemon colored, about 5 minutes. Gradually beat in granulated sugar. On low speed, beat in water and vanilla. Gradually add flour mixture; beating just until smooth. Evenly distribute batter in prepared pan. Bake until wooden toothpick inserted in center comes out clean, 12 to 15 minutes. Meanwhile, place paper towels that are slightly wider and longer than cake pan on a clean work surface and sprinkle generously with confectioner's sugar. When cake is done, immediately loosen from edges of pan, and invert on prepared paper towels. Carefully remove waxed-paper. Trim off edges, if necessary. While hot, carefully roll up cake together with towel from narrow end. Cool on wire rack at least 30 minutes. Dissolve coffee in water and allow to cool. In bowl of stand-mixer combine whipping cream, cocoa, confectioner's sugar, and dissolved coffee. Beat at medium speed until stiff peaks form. Place bowl of mixer over a pot of hot, not boiling, water, melt chocolate together with margarine or butter. Chocolate may be somewhat stiff. Beat in corn syrup and milk until smooth and cooled. Glaze will thicken as it cools. Unroll cake and remove towel. Spread Mocha Cream evenly over cake. Roll up. Place on serving dish, seam side down. To protect serving plate from dripping glaze, line edges around cake with waxed-paper. 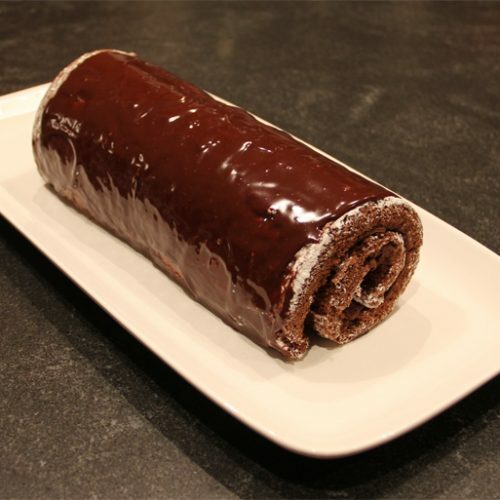 Spread Chocolate Glaze while still warm over top and down sides of roll. Remove waxed-paper. Refrigerate until ready to serve. Variations include substituting the mocha cream with whipped cream that has been flavored with cocoa and hazelnut or coffee liqueur, or ice cream. This recipe can be used to make a Buche de Noel by dusting with some cocoa, adding meringue mushrooms and other decorations. Based on a recipe from Cook's Illustrated, Matthew Herron, May & June 2008, p 19. Add all ingredients except cilantro or parsley to a food processor and process until fully ground and smooth, scraping down sides of bowl periodically. Transfer hummus to serving bowl, sprinkle with cilantro or parsley, cover tightly and allow to sit at least 30 minutes so flavors meld. Before serving drizzle with some olive oil. Serving ideas: Use as a dip for raw vegetables, tortilla chips or chips with sesame seeds, and pita bread. Use to make a vegetarian wrap with vegetables. To prepare using dried chickpeas, place 1/2 cup rinsed chickpeas in large bowl and cover with 1 quart of water. Soak overnight. Drain. In large saucepan over high heat, add chickpeas, 1/8 teaspoon baking soda, and 1 quart water. Bring to a boil then reduce heat to low and simmer gently, stirring occasionally, until chickpeas are tender, about 1 hour. Reserve 1/4 cup cooking water then drain and cool. 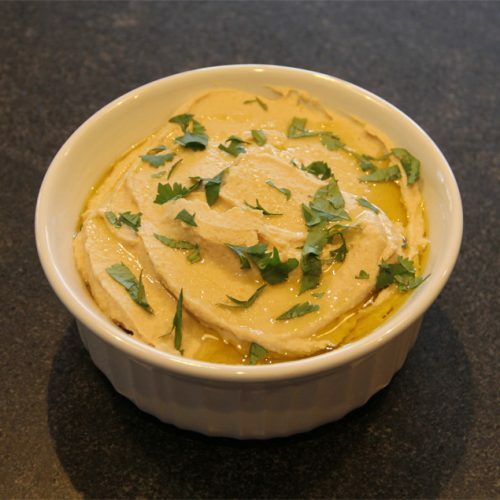 Continue with recipe for Hummus, using cooking water in place of tap water. A classic French restaurant dessert menu item. The caramel turns to a sauce as the custard cooks and, when inverted onto a plate, yields a beautiful golden color. Based on a recipe from The Good Housekeeping Illustrated Cookbook, Zoe Coulson, Hearst Books, New York, 1980, p. 359. Preheat oven to 300 degrees F. Butter eight 6-ounce custard cups very well. Gather a rimmed baking pan to fit custard cups. In small saucepan, over medium heat, add 1/2 cup granulated sugar. Stir with a whisk continually, until sugar melts and turns to a light brown syrup. Distribute evenly into prepared custard cups. Place cups in rimmed baking pan. In large bowl of a stand mixer, beat eggs and 1/2 cup granulated sugar on low speed, until lemon colored. Beat in milk and vanilla. Distribute evenly on top of caramel in custard cups. Put hot water in rimmed pan to just within one inch of top of cups. Bake 1 hour or until when a knife inserted in center comes out clean. Cool on wire rack, then refrigerate until cold. 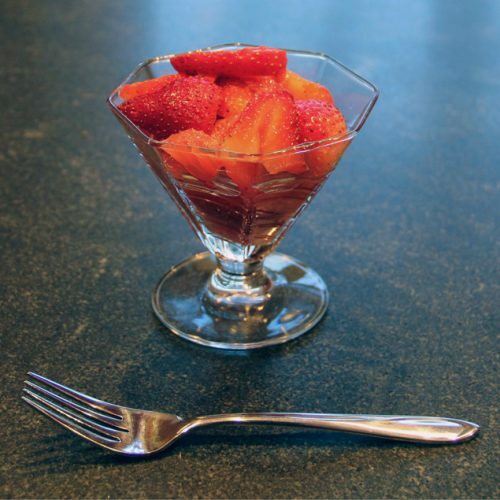 To serve, run a knife around edge of custard cup, place dessert plate on top and invert. 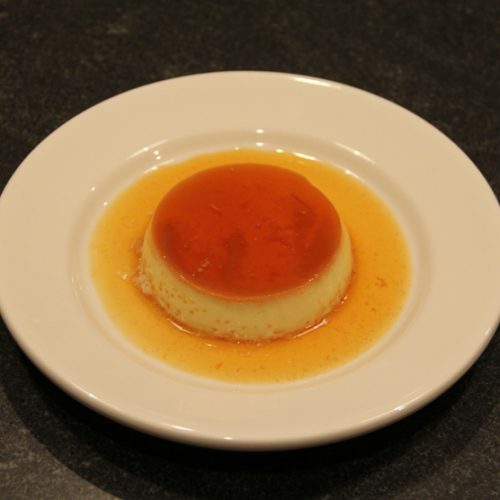 Caramel should flow over edges of custard, forming a pool of sauce around it. Prepare a day in advance or early in the morning. 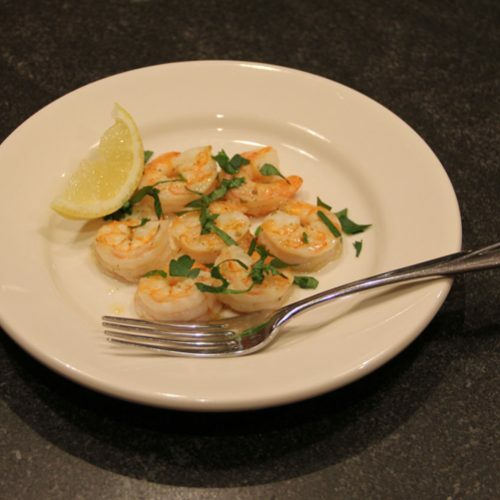 This is a classic recipe for shrimp broiled in lemon, garlic, and butter. A fun fact is that if the garlic is a bit old the acid in the lemon will turn it a blue-green color, so make sure the garlic is fresh! Based on a recipe from The Good Housekeeping Illustrated Cookbook, Zoe Coulson, Hearst Books, New York, 1980, p 164. Preheat broiler. Line rimmed baking pan with foil. 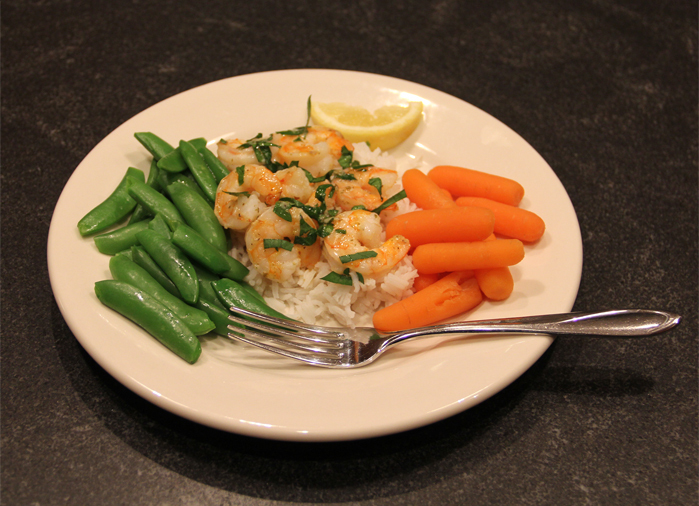 Place shrimp in single layer on pan. In 1-quart saucepan or microwave dish, add minced garlic, butter, and next 4 ingredients (through pepper). Heat until butter is melted. Spoon butter mixture evenly over shrimp. Broil until shrimp are pink and cooked, about 5 - 8 minutes. Serve immediately sprinkled with parsley and garnished with lemon. Serving suggestions include rice and steamed vegetables.